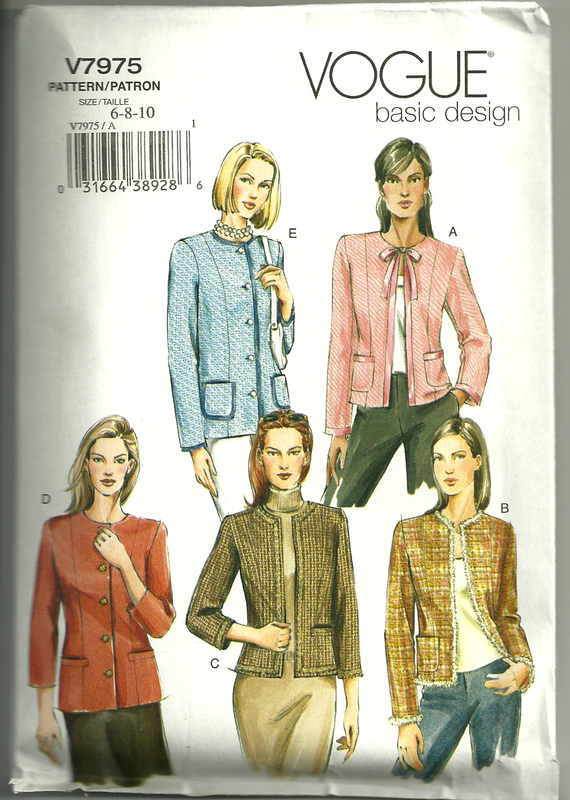 As I eagerly anticipate the Classic French Jacket class I will be taking with Susan Khalje in June, there are several things I am doing to get ready for it. First, of course, is doing my homework. 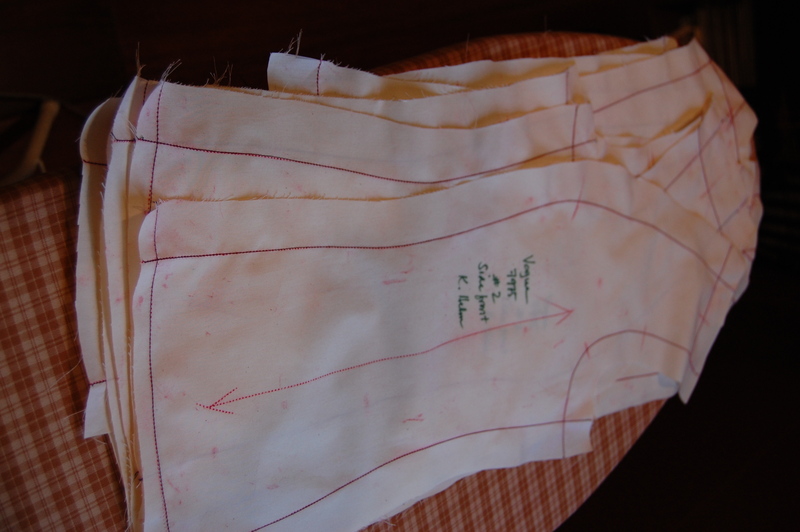 That includes selecting the pattern I want to use and making the muslin. 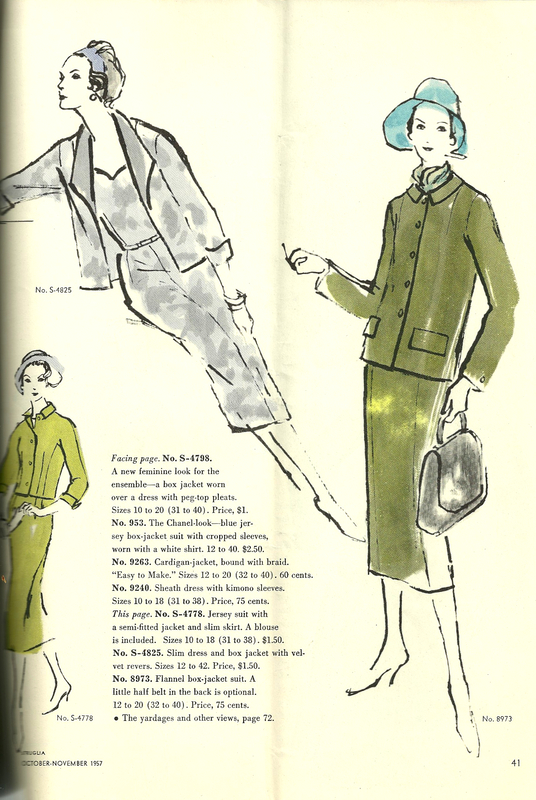 I am sticking with the old stand-by Vogue pattern #7975 (which Susan recommends), as I really do want the classic princess-seamed cardigan look that has evolved from its original “boxy” styling. The view in the lower righthand corner is the version I anticipate starting with. And now those pieces are sewn together as well. We (the members of the class) will be shopping for fabric and trim(s) on the first day of class, so what I end up with is still to de determined. Am I looking for a particular color? Yes, sort of, but who knows what wool will entice me – other than probably the most expensive one! The sketch in jade shows a “best-selling” pattern, newly available printed and perforated. This suit definitely shows shades of Chanel! I like the suit much better than the hairstyle. 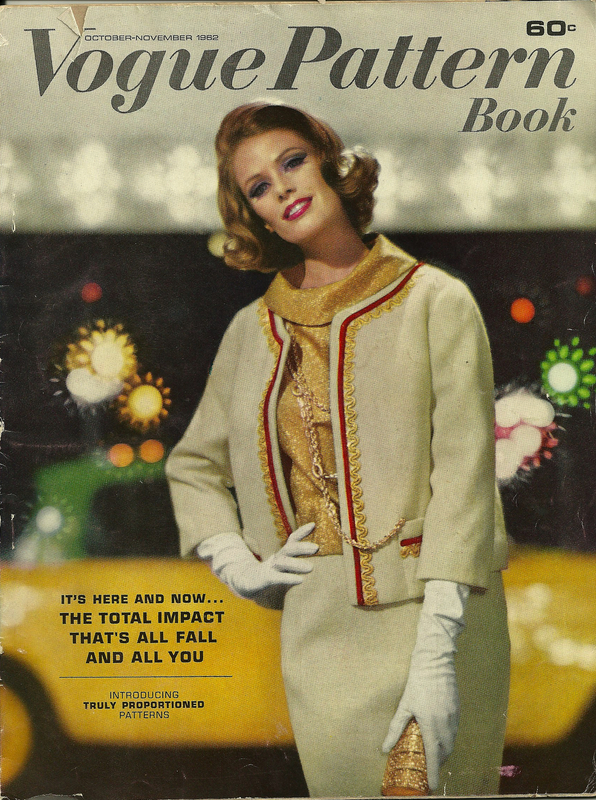 This is the most classic Chanel image I found from the 1960s in my copies if VPB. The topic figure shows the “Chanel” chain fastened to a hemline. Ordering information for such chains was included in the same issue. 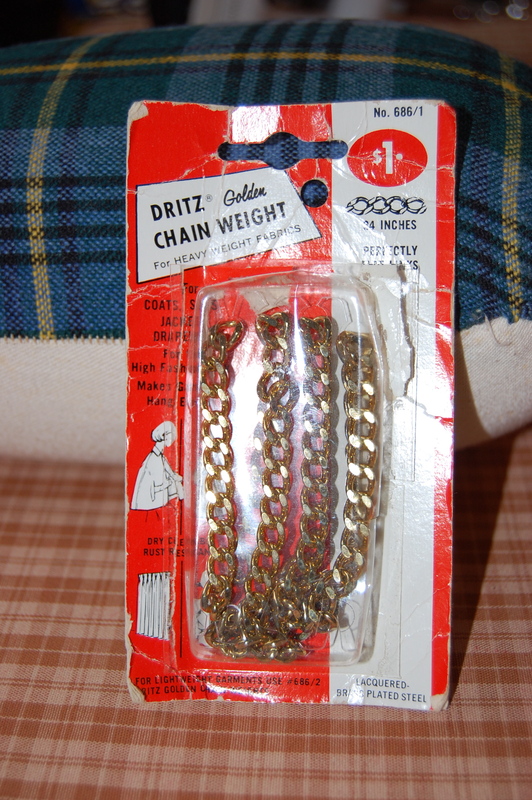 However, I know for a fact that these types of chains could be purchased in fabric stores, as I still have one (in its original –albeit tattered – packaging) that I purchased in the late ‘60s! This “vintage” chain still looks new! 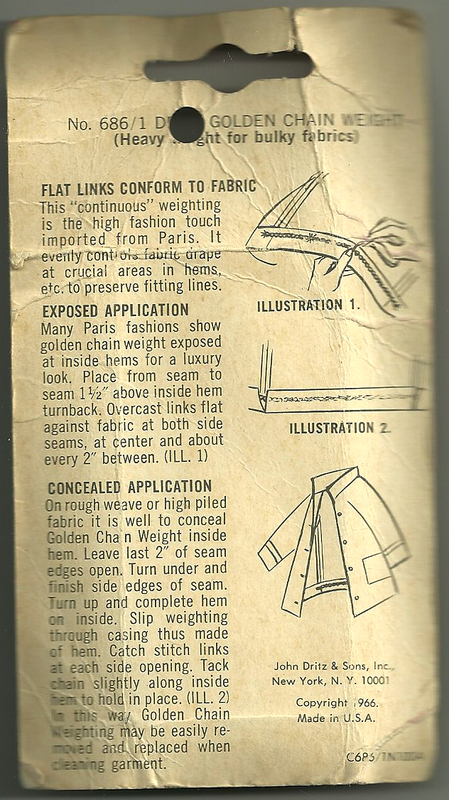 The back of the package shows the copyright date, 1966, and includes instructions on attaching the chain. 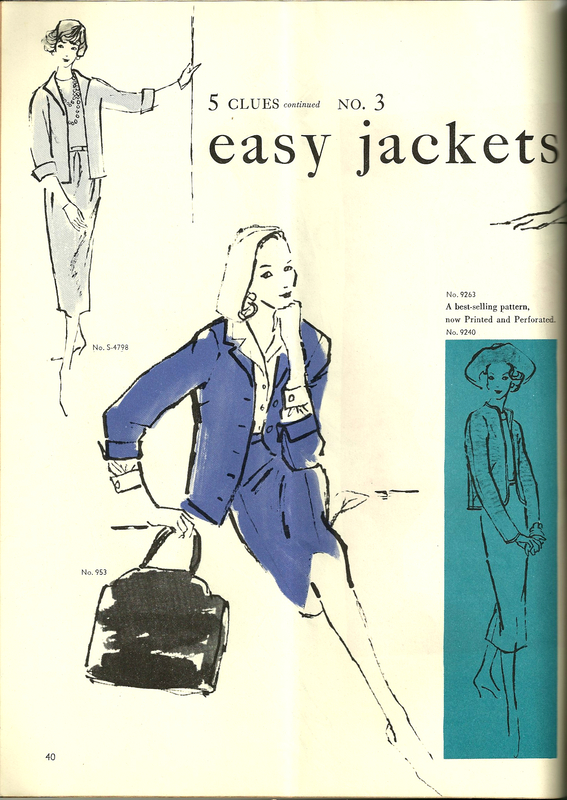 If you can get past this awful illustration, you can read the accompanying text about Chanel-type jackets! Gosh, I think Chanel-type jackets are just about perfect for everyone. How else would this classic style have endured so beautifully for so long? So sad that I will not be in this class with you, Karen. I have adored all of Susan’s classes and I know you will. Can’t wait to see the fabric you choose at Mendel-Goldberg (what a treat)! How exciting! I can’t wait to see the finished product. I can practically guarantee that you will see the finished jacket! I like the suit AND the hairstyle in the ad! =) Can’t wait to see what fabric you use to make your jacket! Your new part-time job sounds wonderful – aren’t they lucky to have you on their staff! We are so fortunate to have so many resources available to us as sewers – and you are so fortunate to have a good fabric store close to you! I am already fantasizing about the fabric I will find for my jacket! Knowing me, I’ll probably end up with more than one choice. Thanks for showing the prep works! Although I can’t take Susan’s class (which must be wonderful!) I look forward to seeing more posts after you attended the class. Have fun! I will certainly be posting about the class, so stay tuned! 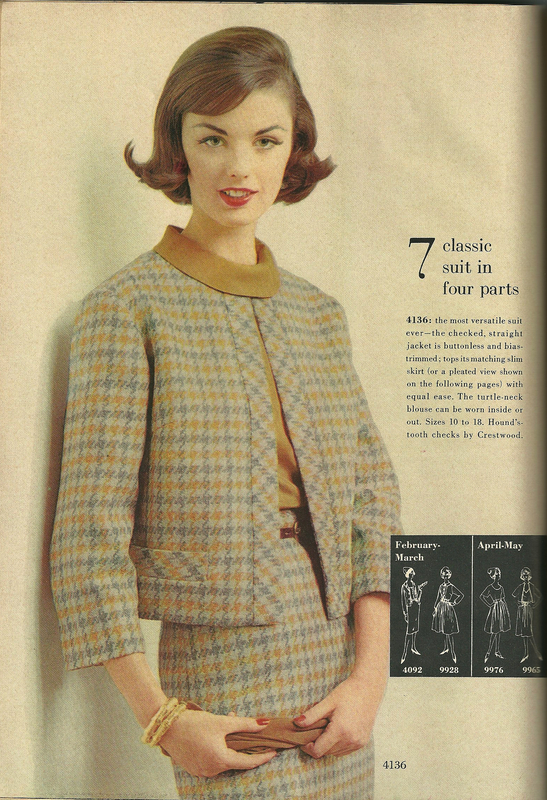 I made this suit back in the sixties in a pale pink light weight wool check. I have lost the pattern and would like to buy a another !. I am finding this very difficult help please. I am not sure which pattern you are referring to. 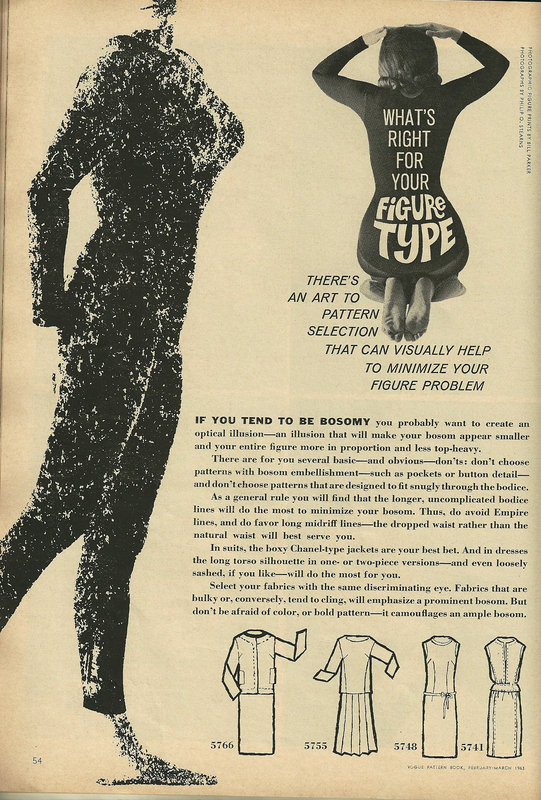 I suggest you Google the Vogue pattern number you are looking for. There is a chance it will come up on either eBay or Etsy. Good luck!